Today I have a big walky Eevee and three walky paper coasters up for auction. 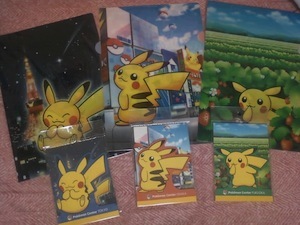 I also have a full set of Pokecen Pika clearfiles, and one of the last PikaPair big plushies for auction! Soooo we are just waiting for the invoive when payments will be due and whatnot.. Sorry for the boring and pointless post. I have screen the original post. I need to calculate totals first. They maybe discounts. not sure. Collection Site and GA Cohost? If you have any suggestions (other than to change my "beautiful" banner thing) I'd be happy to hear them! Also if I've misspelled your username please tell me. I tried to give everyone credit for selling me stuff. If you can help I would appreciate it! I have many things for you today. 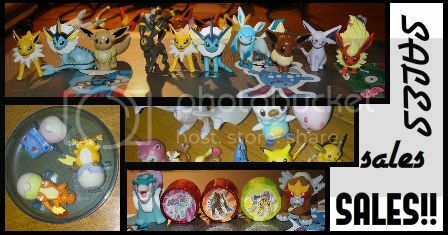 Check them out, along with really cool can badge topper tins, and some Meloetta, Emonga, and Pikachu hair ties. Nurse Audino Tomy MC is also added! 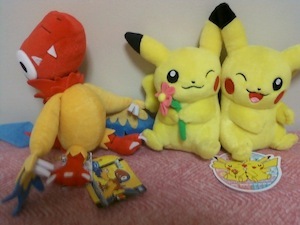 And an OSAKA DX POKEDOLL PIKACHU WITH MINI POKEDOLL also now in stock! -The Meloetta Plushies, figure straps, and Fluffy Plushies will be in Sunyshore this time next week (maybe a little earlier) along with the rest of the 6/16 releases. -If you are combining with Pokemon Mate items, just include a note with your order, if you remember to! GO RESERVE POKEMON MATE. I cannot stress this enough! Already online preorders have 75% sold out, some after one single day. If you want any of these items, I recommend against "I'll check it out later". Right now, the Pokemon Center has a cell-phone survey going on where they ask what we'd like to see as figures - and all of these human characters are included. Hint hint hint? For the future? Character fans rejoice. We're finally being noticed! B/W character cookies for straight sale, and extremely rare Peru Cereal Prize Figures for both (haggling accepted) sale and auction! 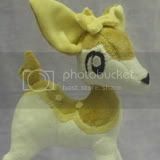 Payments 1 are due for Dragonite Pokedoll plush lot GA! And here are the rules to paying, so please read them first before you pay, thanks! - There are slight discounts for some, and some not. 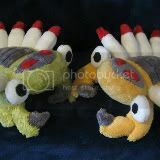 I added the discounted price of the 167$ instead of 234 (which we raised), and the rest (which is the shipping, handling, and fees), I divided up by the plush, since they all seem to have approximately the same weight. I missed my May's post, been busy and all. Recently had my birthday (june 1st) so I've been all over the place. But it's time to get back to commissions! 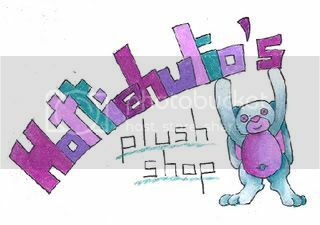 Also Petits, and small magnet straigh sale. I'm looking to buy some Zukan figures (in a week or so, just saving up some money) I don't mind if it's here or in any other webpage. Hello all! 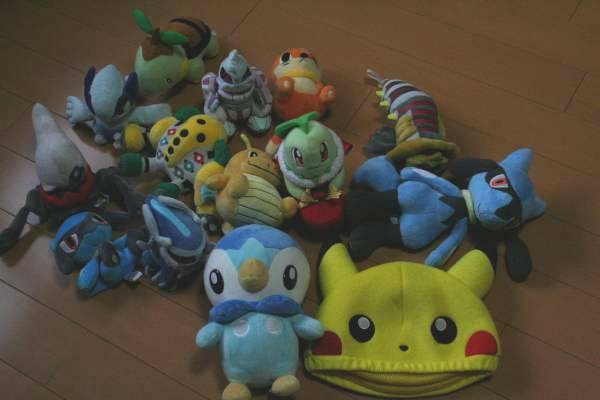 Today, and even last month, some wonderful things have been acquired in the form of Poke plush. Fortunately everything should be on its way by now (at least the things I wanted right away) and today I bring a small update. 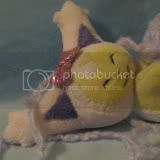 There are at least two more updates on my collection to come, one very huge update including my grail, and a smaller one containing two amazing plush! I've got yearly sales to do for yet another move. I will update this in the next few days since I'm working on borrowed time through my phone, lol. I'll also have some more retro/hard to finds/legendary finds on eBay soon. Please be patient. Hello all! :D This is probably the most special collection update I've ever done and will ever do! 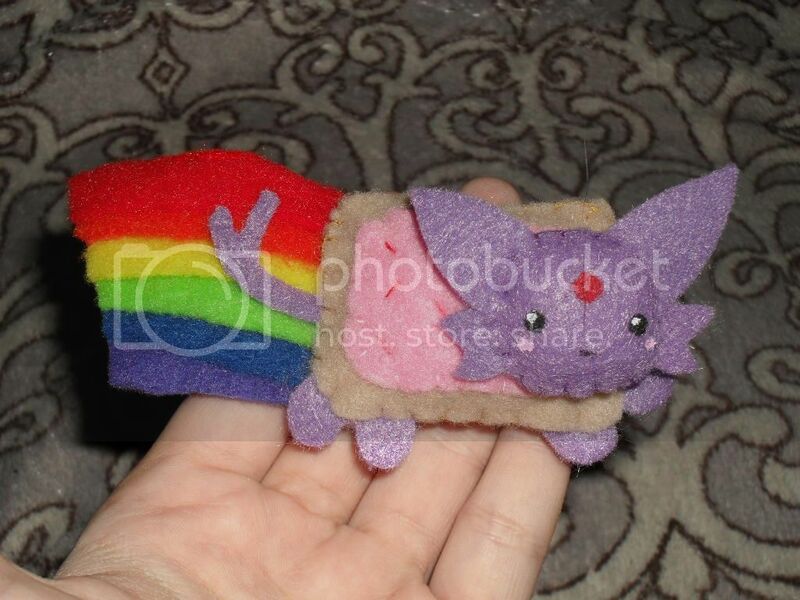 Some of you may remember my post from a little while ago looking for someone to make me a custom Butterfree plush. 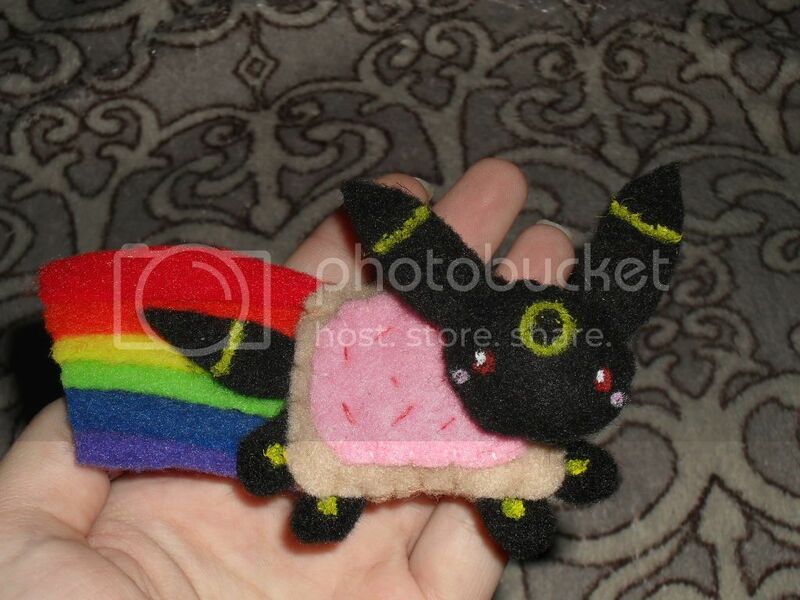 I wasn't totally sure if I'd be able to find a plush maker that would work within my price range, but I was amazed when someone messaged me and offered to make me this very special plush. I honestly cannot thank lyndsaygorawr enough for her kindness, generosity, and amazing talent. I also want to thank the entire community, especially those who expressed their condolences and kind words in my last post :) I absolutely LOVE you guys!! So... without further ado, I'll stop talking, and introduce you all to Nia the Butterfree! Hey everyone, I know it's been a long time. Well I am fully healed from my surgery and feeling GREAT! I have already lost 50 lbs in 1 month and lost 2 pant sizes! Woot! I'm on my way to a healthy life! Anyway, since I'm back, I have to itch to collect again. I really want to collect some Can Badges. 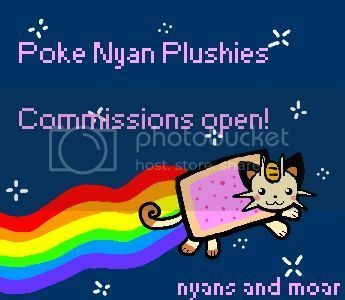 Preferably the ones with my fave Pokemon on them (Pikachu, Emonga, etc.) But I will take a look at any can badges you are selling. So link to your sales post if you have any. New member here! Been lurking on and off for quite a while, but I finally decided to bite the bullet and join a few days ago. I'm perosha and I...don't formally collect any one Pokémon yet but goodness knows how long that will last now that I've joined! ;) Basically, I was inspired to join here by snagging some really interesting (to me!) stuff off of eBay and wondering whether there was more of it. If there is, my wallet is doomed, haha! Just curious, does anyone know of a site that contains info for ALL the pokemon kids that INCLUDES images of each and every kid? 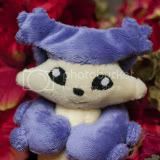 Pkmncollectors' wiki doesn't HAVE images beside every kid, because I always see people saying, seeking ATTACK this or OLD that, but have no idea what they mean! Hi. Been a long time since I last checked this place. Hope all's well with everybody. I'll be heading to NY/NJ tomorrow for BronyCon and will head into the city a for a few days after the event. I've already pinned down a store that sells Zoids, but the other thing I'd like to get my hands on is some of the current Pokemon Model Kits, or the Plamos. Anyone know of a store (or stores) in the area that might carry them? 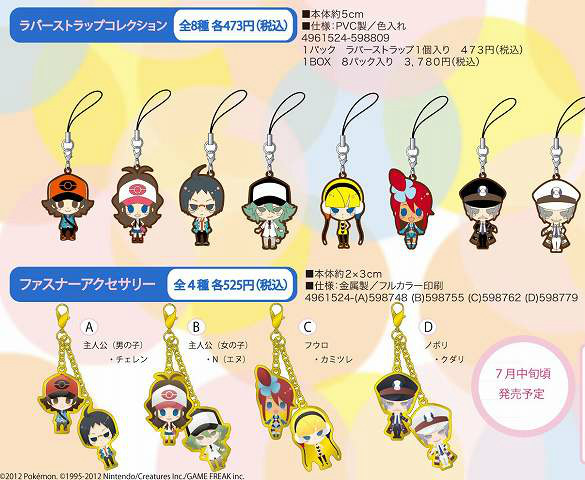 The items on top are rubber straps, and are due in August. The items on the bottom are metal fastener keychains, and are due in mid July!